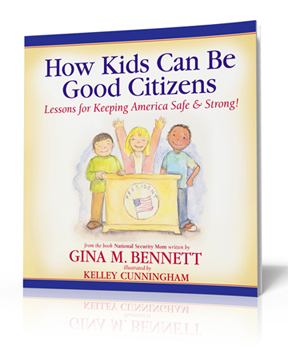 Filled with tips for good citizenships, fun illustrations, action steps, and additional information for parents. Peek at a few pages! Encourage your kids and students to visit our THE NATIONAL SECURITY KIDS CENTER page to start a conversation with the next generation about our national security. Post reviews on your blog, in your newsletter, on Amazon, or email it to us. Share the book trailer and post a comment on YouTube. Show your strength MOMS! 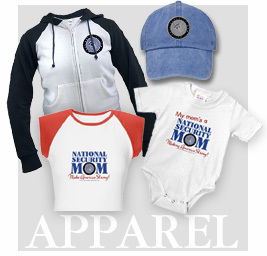 -- Take up the mantle: NATIONAL SECURITY MOM Apparel. Send us your photos to us with it on! * Do you have a popular high-traffic blog, site or newsletter? Email us with subject: REVIEW NSM, with your stats and a description of your venue and audience, and we might send you a complimentary review copy!